The first transition for me was moving from my home country, Nigeria, to England to study – it was very daunting to begin with. 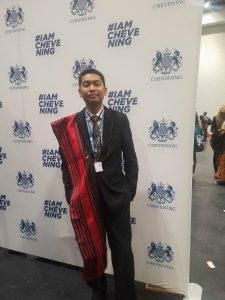 The initial decision to come to England to study for a Masters was very different from the decision I made to stay to further my studies and start a PhD. 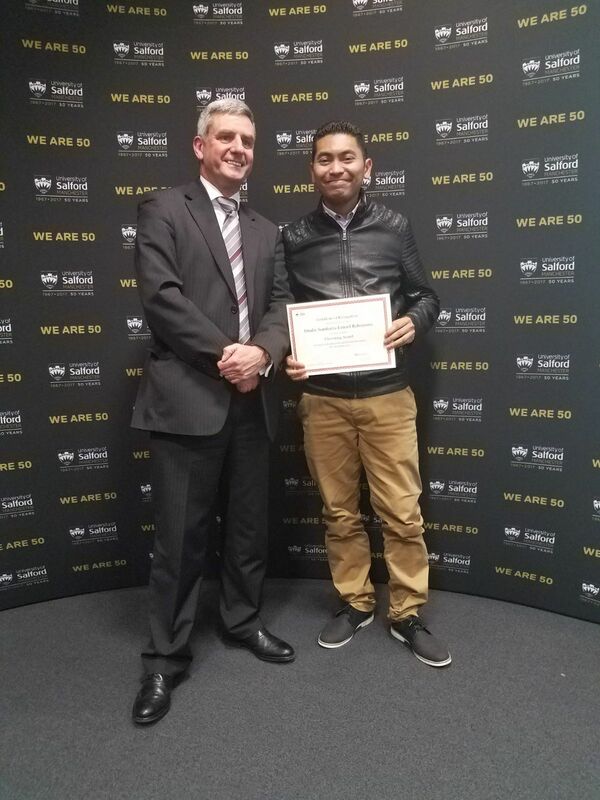 When I came to England to study for my Masters, I wanted to gain further skills and knowledge – the decision was based on the challenge to get better academically, and in turn to inform my future career path. The decision to further my education and embark on a PhD was based on the skills and knowledge I had acquired during my Masters degree. The wide range of resources available to students to make learning convenient at the University of Salford was beyond expectations. 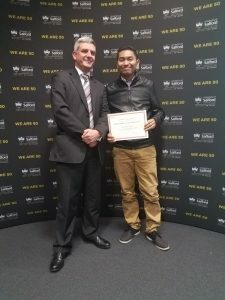 As a postgraduate student, I had unlimited access to an extensive range of books, e-books, journal articles, and government publications to help me study, as well as request for articles that are not licensed to the University. The major influence in deciding to apply for a PhD was based on the final semester of my Masters programme, when I conducted a research study for my dissertation. The research study examined the associations between sitting at work and mental wellbeing. I loved the idea of looking into a problem and trying to find out as much as I could about it, and looking into something that there was little previous research on. That’s the joy of being a researcher (although it is not always as simple as it sounds!). The progression from a postgraduate taught degree to a postgraduate research degree is a big step in one’s education, because the doctorate degree is seen as the highest level of educational achievement. The move from a ‘regimented and structured’ life of a taught programme to the ‘unstructured’ life of a PhD can be scary. This is because the structure of deadlines and assignment submissions is no longer there – you have to carefully plan your own time and set your own targets. 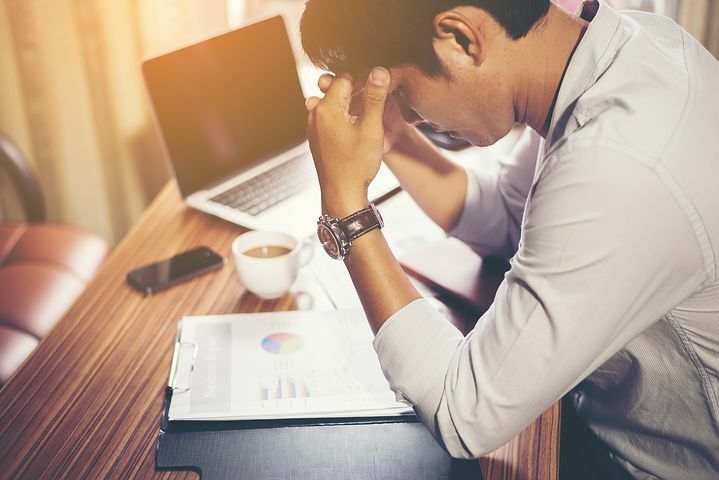 It can be quite overwhelming at times, sitting in an office every day of the week, rather than attending classes for two to four hours every day. I am in an office with other PhD students, many of whom are working in studies that are not related to my field – this can make the PhD journey lonely at times, but also interesting because I get to learn about things outside of my own area of research. When I started my PhD, all of a sudden I was exposed to all these opportunities and changes. The PhD involves independent research and that means a lot of input from me as a researcher – like I said, it can be quite scary if you face it all alone. The University has provided various workshops and study skills sessions to help me adapt to the system, without feeling too overwhelmed! Also, there is an allocated staff member to stand in as a personal tutor to help discuss any issues that may affect one’s studies. I have made use of these resources and intend to keep making use of them. So far so good, it’s been an interesting journey and I hope it will get even better! In the first year of Abolanle’s PhD, she has had the work from her Masters study accepted at the International Conference on Ambulatory Monitoring of Physical Activity and Movement (see poster), and has recently submitted work from her first PhD study to the International Society for Physical Activity and Health Congress. Realistic workloads, supportive managers, fairness, and a bit of recognition for good work: are things like this too much to ask for employees? I’ve always been interested in work psychology, even before I knew it was possible to study it; after all, who wouldn’t be interested in making work better and less ‘stressful’? Despite recommendations from the National Institute for Health and Care Excellence that preventative interventions (strategies that target potentially stressful working conditions rather than employees’ ability to cope with them) should be prioritised, there is relatively little research of this type. Many years later, and having just completed my PhD looking at how employers might improve work for employees, and I’m probably a bit more realistic about how challenging that can be! Who wouldn’t be interested in making work better and less ‘stressful’? Can we make work better? I was initially surprised when I started my research that the evidence for methods of improving work for employees and supporting their psychological health and well-being was rather mixed; some studies reported reasonable results, but many seemed to suggest they didn’t do any good at all. I soon found that this is in part because preventative approaches are usually very complex and involve lots of people and decisions, as well as relying on effective implementation. On top of that, there are likely to be many contextual and practical factors that can influence the process: unexpected events, organisational changes, limited resources, and even cynical employees, have the potential to derail even the most careful plans. So my initial focus on whether or not preventative approaches were effective quickly shifted to look at why even the most well-intentioned efforts can lead to disappointing results. My research aimed to add to our understanding of the factors that can derail them and learn lessons that can help with future efforts. It’s certainly not all bad news, because there are things that employers can do to improve things, they just need to be aware of some of the pitfalls and get the planning and implementation right. For example, ensuring that employees have a say in identifying what aspects of the workplace should be prioritised, rather than senior managers deciding what’s best for them. Then there are seemingly obvious things – that are often forgotten – which can make a huge difference: communication, and follow-up. If you’re going to start a project to improve your workplace, it is vital to keep employees up to date on plans and progress, and that any promises are followed-up – fail to do that and employees might see yet another ‘well-being initiative’ introduced with great fanfare before it silently disappears under layers of new priorities. Is it any wonder employees might be cynical at times? There’s no one-size-fits-all solution, it’s incredibly complex, but thankfully the evidence suggests there are things that can be done. It can also be challenging to conduct research in organisations – although well worth doing – because, let’s face it, they are not there for the benefit of researchers. They naturally have their own priorities. For example, in my research, the organisation I worked with were supportive of my work and very keen to take action to improve things for their employees. However, because they were severely hampered by substantial cuts to their budget during my PhD project it meant large-scale restructuring was required, making it very difficult for them to fulfil all their original plans. 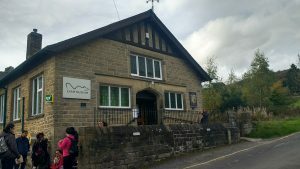 As a researcher this was hugely frustrating, particularly as I had to complete my work within a set timescale, but it was obvious the organisation was being stretched and doing their best under very difficult circumstances. As a result, things didn’t happen when they were supposed to, or didn’t happen at all in some cases; welcome to the ‘real’ world of research! However, it taught me so much and it is probably a better piece of work because of some of these challenges, to be honest. There were also some positive outcomes (and plenty of lessons) for the organisation to use as they continue with their work to support employee well-being. 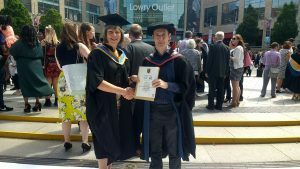 And, as I graduated at The Lowry on the 18th July 2017, and having progressed to a lecturing post at Staffordshire University, I was able to look back with so much pride and wonder how on earth I got there! The graduation was made all the more special by receiving the Professor Lindsey Dugdill award for my PhD thesis. Knowing how much Lindsey meant to her many friends at Salford, it’s quite hard to adequately express how much more this award means as a result. I was fortunate to meet Lindsey during my PhD, but I’d like to finish with an experience that took place several years previously when I submitted a proposal for a different PhD to the university. I had lots and lots of questions, and I was advised to contact Lindsey as the proposal was in her field. She was incredibly generous with her time and advice – spending her own time talking through my ideas and giving feedback. It is worth emphasising that this is despite Lindsey not being involved in the project, and had never even met me before – I was just a potential student with an interest in Lindsey’s field of expertise (or one of them!). It would be a better story if my application had been successful but circumstances at the university meant the funding was unavailable – Lindsey still got in touch with some encouragement. I cannot tell you how much I appreciated the time and trouble she took to help someone she didn’t even know, and I was delighted to be able to tell her in person when I actually joined the University a couple of years ago. Having met Lindsey, and having worked alongside so many of her close friends in Public Health and Psychology, I know this sort of support and encouragement was not a one off, which says it all really. A lovely person. James is a researcher with experience using both qualitative and quantitative research methods and an understanding of the social determinants of health, particularly the role of work and how the psychosocial work environment impacts on employees’ mental and physical health and wellbeing. His PhD explored the impact of working in a social enterprise on employee health and wellbeing through the lens of ‘good’ work, culminating in the development of an empirically informed conceptual model that illustrates how working in a social enterprise may lead to improved health and wellbeing outcomes. James was awarded a BA (Hons) in History and Politics from Keele University in 2008 and an MA in Political Economy from the University of Manchester in 2010. His MA dissertation explored the relationship between income inequality and health, which focused his interest on the areas of public health and health inequalities. Prior to starting a PhD in Public Health at the University of Salford, James conducted a literature review for the university in 2011 on the impact of working for a social enterprise on employee health and wellbeing – this project served as a platform for his PhD research. His PhD explored the experience of working for a social enterprise – an organisation with social aims that uses profits for that purpose – and whether these organisations provide good quality work conducive to employee health and wellbeing. Using a mixed-methods approach, comprising (i) a mapping study that identified social enterprises active in the Greater Manchester region, (ii) semi-structured qualitative interviews, and (iii) a survey completed by social enterprise employees across the region, the research finds that social enterprises provide good quality work environments conducive to employee health and wellbeing – furthermore, when compared to a national sample of individuals working in non-social enterprise organisations, social enterprise employees report significantly higher levels of control over their work, support at work, job satisfaction and job-related wellbeing. 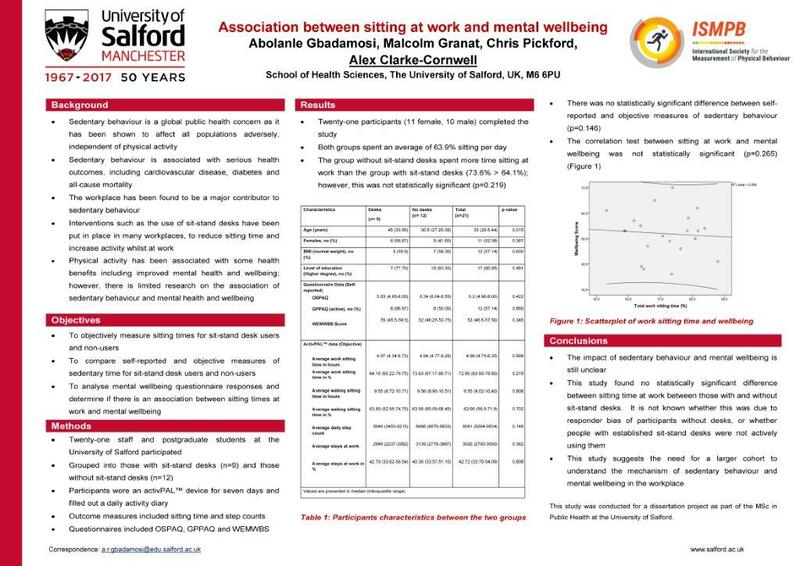 Chandler, James 2016, A study to explore the impact of working in a social enterprise on employee health and wellbeing in Greater Manchester , PhD thesis, University of Salford. Work Foundation’s Health at Work Policy Unit publishes its latest report: Who cares? The implications of informal care and work for policymakers and employers. • Managing migraine: a women’s health issue? For more information, see our background paper and accompanying infographics. Read the full report or executive summary. Please feel free to contact the report’s author, Dr James Chandler, for more information. My name is Umar Kabo Idris from Kano state, Nigeria. I am a passionate public health professional who is highly interested to be a part of strengthening health systems and closing the wide gap of health inequality in Nigeria. In pursuance of this interest, I was fortunate to work with an NGO that plays a vital role in health systems in northern Nigeria through the use of appropriate technology. My interest grew even bigger while working in many rural areas across various states. After working for almost two years, I thought of getting a masters degree in the field of public health in order to acquire the appropriate research skills and vast knowledge to fulfil the desired passion and achieve my end goal of changing people’s lives in the area of better health services and to also advocate for better health policies. With gratitude to God, that has been achieved as I have just concluded my masters degree program in Public Health from the prestigious University of Salford, Manchester. During the masters programme time, I thought of a dissertation topic that would fit into what could change or bring in better health policies, add value to our localities particularly with regards to improving the lives of people in my state. I arrived at something to do with technology because from my ideas and those found from research, it is clear that technology is massively used to support many interventions through health systems strengthening in many developing countries. The research looked at the impact of local public health workers using GIS technology for polio vaccination coverage. It was a successful research, in the end we explored on ways the same technology could be used in other local interventions especially now that Nigeria is officially no longer listed as a polio endemic countries. Thereafter, that led us to find out the prevalent diseases that needed more attention and how the technology could be used to support those interventions. The journey of my passion did not stop at that, my masters research has given me a broad scope of what I love to do. I immediately got the opportunity to apply for an opening of Assistant Project Manager in my second week of coming back. I applied and was called for interview due to my experience of work in the same organization I left for masters last year. Part of the job interview focused on my dissertation findings and it was an easy ride for me. In the end, I can say I got the job and my first task is to be a part finding out how we can use appropriate technology to support the upcoming measles campaign scheduled to take place in the third week of November 2015. I am highly exited and happy to get my masters from a great team of public health in the University of Salford, even more so from my inspiring project supervisor (Anna Cooper). I am also happy that I am on the right track of achieving my aim.